A fire at a home for elderly and disabled people in western Latvia has killed at least 25 people. Firefighters called overnight to the home in Alsunga, west of the capital, Riga, found the entire building ablaze. The roof collapsed as rescuers led 66 people out, hampered by temperatures of minus 30C and by the fact that most residents were severely disabled. It is believed to be the worst fire disaster in the Baltic republic since independence in 1991. The fire broke out soon after midnight and firefighters took several hours to bring it under control. No cause of the blaze has been established yet. The authorities have declared a national day of mourning next week, on Wednesday. 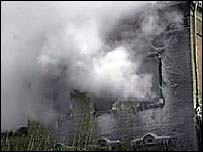 President Vaira Vike-Freiberga has expressed her condolences, saying the fire was "a tragedy for all Latvia".